2012 was the year of the motorized fishing kayak – Not just a common sit-n or SOT kayak outfitted with a lame electric trolling motor, but the real thing: a motorboat as American anglers understand it, and this means a boat powered by a gas engine – typically an outboard motor. And by motorboat we don’t mean one that offers just inland fishing on flat water but cannot be used for offshore fishing – What we’re talking about is real ocean fishing capabilities, from surf launching to trips that are several times longer than what electric motors may enable before they run out of electricity. This also means sufficient stability for stand up fishing, dryness (sorry, we don’t buy the notion that kayak fishing is a wet sport…), sufficient storage space for long trips, and a comfort level that’s acceptable for anyone, and not just for young, lightweight and athletic fishermen. No-motor-zones? Not necessarily a problem when you can instantly switch to a human powered mode of propulsion – paddling in most cases, poling in shallow water, and rowing if you prefer! This is no longer an experimental concept – People enjoy the advantages of fishing out of W motor kayaks worldwide, and if you ask many of them, the boat they fish from is a personal skiff that offers some extra advantages compared to small motorboats (skiff, jon boat, bass boat, etc.) and kayaks. From now, this online kayak fishing magazine will focus exclusively on Motorized Kayak Fishing. We’ll publish articles, videos and reviews related only to motorized fishing kayaks: Inland and offshore, in shallow and deep water, in cold climates and in warmer ones, in bass fishing trips and when fishing for other fish species. Kayaks’ sub-par ergonomics are putting thousands of kayak anglers in harm’s way, a problem that is easily surmountable by switching to a more ergonomic kayak such as the W fishing kayak. First, there’s the peril of being unable to paddle back to shore due to fatigue or exhaustion. In addition, anglers who are elderly or inexperienced, or just plain tired, can be at risk from outside hazards outside of their control such as strong wind or tidal current. If kayaking in your traditional kayak makes you tired quickly, consider switching to something more comfortable, with better tracking and easier paddling, namely a Wavewalk kayak. Seasonal problems, such as overheating in summer, and hypothermia in winter, are also big threats, since they drain your energy and make it difficult or even impossible to return to shore. Traditional kayaks that expose the user to the elements are costly both on your health and your wallet, for when buying extra gear such as dry suits to protect yourself you are potentially forking up hundreds of unnecessary dollars. Other heavy clothing, such as boots and waders, can disable you from swimming, and from getting back into your boat, or kayak, a very precarious situation to say the least. Paddlers of traditional fishing kayaks are also susceptible to cramps, leg numbness and even partial paralysis, a problem that is virtually nonexistent in the W Kayak. Leg cramps can be very painful and long-lasting if you can’t stand up safely in your craft to loosen up. Sit-in and SOT kayaks restrict you to sitting in an L shape, with your legs forced forward and clamped by footrests. Paddling or fishing in this position for extended period of time all but guarantees the onset of cramps and leg numbness, a very uncomfortable paddling experience. Both leg pain and leg numbness also prevent you from balancing and maneuvering your kayak efficiently, a very dangerous dilemma. Examples like this are very common, many regular kayakers report experiencing similar discomforts with their sit-in and SOT kayaks. Many kayakers and kayak anglers have become so accustomed to this stiffness that they regularly stop their paddling and fishing just climb ashore and ‘unkink’. ‘Unkinking’ basically means stretching and allowing some reprieve for the tensed back and sore legs. This hassle is completely unnecessary when using the W Kayak because the user can easily stretch within the spacious confines of the craft itself, allowing you to finish uninterrupted and comfortably. 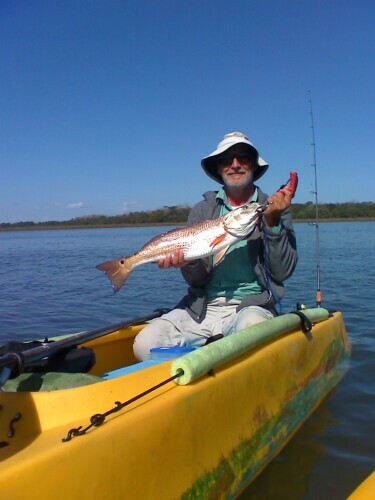 So in order to enjoy more hours of kayak fishing without the pain, danger, and hassle of traditional SOT and sit-in kayaks, make the switch to the W Kayak, and if you want, learn more about kayak fishing pains on Wavewak’s website.